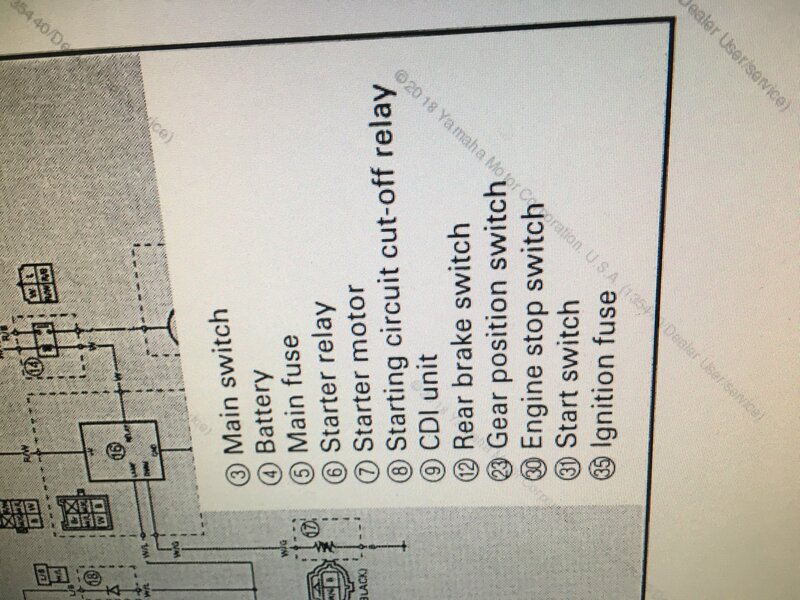 It will not turn over with starter and will not fire while pulling pull start. The only thing that Ive tested that didnt test correct is the kill switch I read on another forum to test black and Black/white wire for continuity when in off position I did and it shows continuity like it should. Then when you slide it to run it should be open and show no continuity which mine still shows it while in the run position. So I unplugged the CDI just for sakes of doing it and the kill switch then tests correct. So where should I test next without unplugging CDI? Did you test for spark when you had the switch disconnected from the module? When the key is on, do you get any power to the gauge? Neutral light coming on or any other sign of life? Yes neutral light comes on. Put in reverse that light works. Press start button oil temp light comes on. No starting and no firing. This is how all this started..
Was riding late one evening when my headlight bulbs blew and busted bulbs didn’t blow fuse. Few days later it just cuts off like turning the switch off look and it blew ignition fuse tried another and blew it. So come to find out fried CDI replace it with a cheap one off amazon that you can no longer find so I wonder if it’s really any good.... and rec/reg and new battery no more fuse blowing but won’t turn over with starter. Jump solenoid and it turns over but no spark at all. Next test is to see if any power is getting to the starter motor when the button is pressed. Best to use a test light, connect it to a good ground and probe the positive wire at the motor. It acts just like a safety switch. When I test my kill switch it says with switch in off position it should show continuity on black and black/white wire it does then says to slide it to run position and it should be open no continuity but it still reads continuity. Multiple problems,no spark,no crank.A blown fuse is rare.A vibration damaged fuse is common.Busted bulbs?as in the glass broke?Anyway,we need more information.Does sound like you have a wiring harness rubbed through,and have a short.Also,checking the kill switch,it has to be unplugged from the harness.Also,rarely,the back of the ignition switch comes loose,and turns,can cause strange problems. Fuses are all good have checked them all with test light. Replaced rectifier/regulator and CDI with cheap one it stopped blowing ignition fuse but still not turning over woth start button or firing. I just wonder if CDI is proble since black/white wire runs into it? So how do I need to check kill switch? Also can’t see a problem with wire harness anywhere unless it’s inside wires somewhere. I do not have your repair manual,a few more posts then you can download it.The older units would crank without starting,the newer units changed. So it’s possible it could be the cheap CDI? I have the clymer manual. 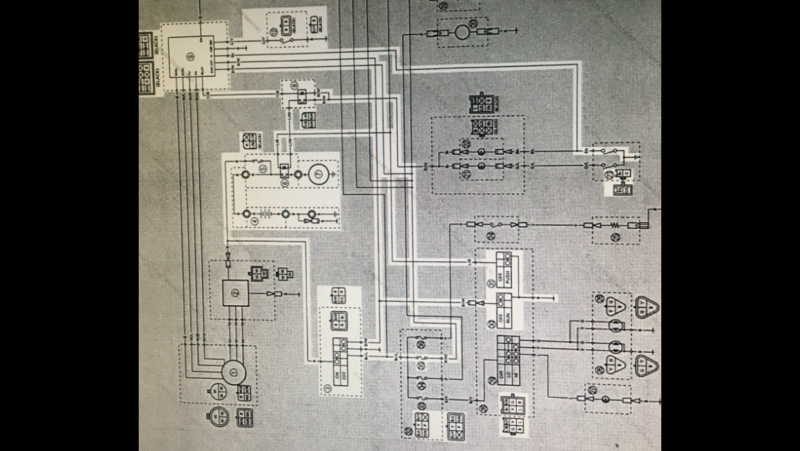 I do not have a wiring diagram for your unit,but,is inconceivable a CDI box would keep your unit from cranking the engine over. So your saying it may be possible the CDI is problem or most likely not the problem? Any other suggestions on anything else or where to look next? Take to a repair shop. Lol good one... thanks for the insight. At the starting circuit cut off relay there is 2 red/white words that go in a slot together and 1 red/white wore in a slot a blue/white wire in a slot and a yellow/black wire in a slot all of these are hot until you press start button except blue/white it’s the only one that loses power. ok I’m back from vacation and gonna bite the. Bullet and order a new CDI. What are y’alls suggestions on what brand to buy and what website to order from? Thanks. Has new top end, piston, rings, valves, etc. great compression, good spark, plenty of fuel. Valves have been set. timing has been tripled checked. Can not get it to start. any ideas suggestions on anything I am missing. Also if anyone has the service manual it would be greatly appreciated.